One of the most thrilling things about growing and designing seasonal flowers is how they can connect us, even when we’re continents apart. I’ve always said that flower people are some of the nicest people you’ll ever meet, and today’s interview further confirms this. Becky Crowley is someone I’ve admired from afar for a long time, and I’m so happy to be introducing her to you today if you don’t already know her or follower her online. Living and gardening in the East Midlands region of England, Becky Crowley grows flowers for the cutting garden at Chatsworth House, the estate of the Duke and Duchess of Devonshire which is in Derbyshire in the North of England. In addition to running the cutting garden, she also has an Etsy shop filled with beautiful botanical prints and cards. I recently ordered a bunch, and they are even lovelier in person. As she shares with us, you’ll learn about how she landed this incredible job and how her past experiences prepared her for where she is today. You’ll also learn about the important charity work Becky supports as a volunteer and through sales of her prints. I hope you enjoy the conversation as much as I did. Erin: Becky, I am so delighted to have the opportunity to connect with you today. For those that don’t know you already, please share a bit about yourself and your role at Chatsworth House. Becky: Hello Erin, it’s a real pleasure. Thanks so much for asking me to contribute to your blog, as it’s been a valuable resource for me over the years. For those who don’t know about Chatsworth, it is a mind-bogglingly grand stately home often referred to as the ‘Palace of the Peaks’ due to its location within the Peak District National Park. There’s been a house here since the 1550’s when Bess of Hardwick and her husband William Cavendish made it their home. It is the Cavendish line that continues today with the 12th Duke and Duchess of Devonshire who live at Chatsworth now and for whom I grow cut flowers. Things have changed a great deal over the years though with the property, including the gardens, now being owned by a charitable trust and open to the public for nine months of the year. So it’s my role to try to make a beautiful cut flower garden for visitors to enjoy whilst ensuring that we produce the quantities of flowers required to decorate the private rooms of the Duke and Duchess and for all the big events that are held in the house. We also provide the Chatsworth farm shop with flowers and a growing number of weddings too. Luckily I work with a team of three excellent florists, so for the most part I am able to concentrate on the growing and gardening. The cutting garden is a one acre site, but it is set within a three acre kitchen garden where my colleagues Stefan Homerski and Glenn Facer grow an amazing range of fruit, vegetables and herbs. We have four beautiful Victorian glasshouses at our disposal too, two of which I use for cut flowers, starting with anemones and ranunculus in March and ending with a selection of chrysanthemums in November and December. Erin: I’m amazed at the diversity of plants that you tend at Chatsworth gardens. How do you stay organized and plan your work? Can you describe what a typical day is like for you? Becky: What has become clear over the years is that I’m most organised when I have a good balance between work in the garden, work in the glasshouses & planning. I haven’t always managed to get this right; if I get too caught up with jobs in the garden, I might miss important glasshouse work such as a sowing that I’ll regret later, or the chance to deal with aphids before they get out of hand! Likewise, if I spend too much time in the glasshouses, my absence from the garden soon shows, and one winter I planned the year ahead to the very last detail but didn’t leave enough time to complete the crucial work on the ground before the season started, which put me & my meticulous plans very much on the back foot. So a typical day or week varies with the seasons, but will generally involve a combination of hands-on work in the garden and the glasshouses combined with planning for what’s ahead. Today for example, after checking and watering all the glasshouse plants, I set this year’s sweet pea seeds out to pre-germinate, then cleaned & divided dahlias, potting some of them up ready to take cuttings from. Tomorrow will be different, as I’ll work with one of our students and a volunteer to barrow tonnes of mulch onto the beds, cut back perennials and dig out plants that are not earning their keep. As we’re clearing and mulching the beds I’ll be concocting plans in my mind (& in my notebook) about what I’d like to grow in the coming year, considering previous successes and failures and working out what I can improve. Later in the week I’ll pull together my seed & plant lists & plan what to grow in the space we have available, working out quantities & drawing up a seed sowing time-line for the coming months. Erin: It’s incredible to look back on life and see how past experiences have prepared us for where we are now. What previous experiences have prepared you for the incredible things you’re currently doing? Becky: This is such an interesting question. I didn’t even know this job existed when I was younger, yet when I look back at many of my previous experiences, they seem entirely relevant to what I do today. Art & creativity were central to my life when I was growing up, and as a young adult I studied fine art at University. I certainly wasn’t a gardener at that point, but I’d spend days on end drawing flowers, studying them as they changed over time. After university I became a florist (entirely by chance) and then went on to train and work for several years as a garden designer. I also had a short, but very interesting, time as a horticultural researcher for the BBC, working on television output for the RHS flower shows. Although I loved each of these jobs, I couldn’t shake the feeling that I wanted to spend more of my days outdoors. On a visit to Chatsworth years earlier, when I was around 19, I’d seen a female gardener and instinctively thought ‘I’d like to do that’, despite the fact that I was then fully engrossed in my art studies. Later, as my career path turned more towards horticulture than art, that thought kept returning to me, until I eventually did something about it and signed up to a horticultural bursary scheme here at Chatsworth in 2012, which is now called the Historic and Botanic Garden Trainee Programme. Once I’d completed the scheme I spent a year working part-time as a florist for the Duke and Duchess, covering the maternity leave of my colleague Sally Burchby. Serendipity then played its part when the cutting garden position became available. By this point I’d already become an avid reader of your Floret blog posts and was following many of the farmers and growers who were establishing an exciting new movement in British flower growing. Erin: What are a few of your favorite flowers each season? Is there anything new you’re excited to grow for the first time in 2019? Becky: Where to start! Well, the first flowers of the year have the added bonus of signifying the end of winter, so they’re always extra special. For us, these are the anemones and ranunculus that flower in March and April. We’ve been able to grow some particularly special varieties thanks to a ‘bulk buy’ co-ordinated by the excellent Flowers from the Farm network here in the UK. We grow them in the glasshouses so they provide a sneak-preview of the season ahead, but outside in the garden it’s the tulips that declare the true arrival of spring. In my first season here I grew a huge range of different tulip varieties with the idea that the Duke and Duchess, the florists and I would critically analyze them, coming up with a finely-honed palette of the very best. It was a hopeless effort really with so many remarkable varieties available now, so I continue to get carried away each year & grow as many as we can manage. I’m a big fan of Fritillaries in the spring too; both the big bold imperialis varieties as well as the smaller delicate species such as michailovskyi & assyriaca. And then there’s the plum, cherry & apple blossoms too; so much beauty. The peonies signify the move from spring into summer for us; they’re one of those short-lived but spectacular seasonal events that bring a lot of joy to the garden in June. I guess they could be considered as one of the perennial show-stoppers that we have in the cutting garden along with the lupines, delphiniums and bearded iris, but it is often the more delicate or textural components that add something special to a bouquet or arrangement, such as honeysuckle, the young fruits of raspberry canes, the smaller heads of annuals such as nigella and scabious (Scabiosa, pincushion flower), along with seed-heads when they’re still in the green & the scented stems of herbs such as mint, oregano and fennel. With this in mind I’m planning to add vines, hops, jasmine & more herbs to the garden this year, although I’m eyeing-up a few fancy bearded iris too! Like many other flower growers, I’ve become a dahlia addict in recent years and have grown particularly fond of the elegant forms of waterlily and collerette types, of which I’ll be adding more to the garden soon. May will see me enlisting our students and volunteers to help get the dahlias planted, watered and staked, but our efforts should be re-paid with their continual supply of blooms from summer through to autumn. As the days grow colder our glasshouse chrysanthemums provide the final cutting crop in the glasshouse. With chrysanthemums I find that it’s better to opt for quality over quantity as the dis-budding needed to achieve the big blooms is a time consuming process. ‘Tarantula’, ’Spider Bronze’, ’Avignon Pink’ & ’Bigoudi’ have got me hooked on chrysanthemums & I like to trial a few new ones each year. The China asters that you’ve trialed in recent years have a similar resemblance to some of these chrysanthemums, so I can’t wait to grow them for the first time this summer, especially ‘Moonstone’ and ‘Valkyrie Chamois’. By Christmas, the cutting garden is pretty much bare but the florists have the luxury of being able to decorate the house with exotic orchids, amaryllis and other forced bulbs, all grown in a large ‘service house’ by gardeners Marcus Goodwin and Ian Bell. They grow an incredible range of pot plants for the house, many of which are of historic horticultural significance, harking back to the days of Joseph Paxton and the Victorian plant hunters. There are also well established shrubs of Hamamelis (witch hazel) & mahonias out in the wider garden which are judiciously snipped from in January. Soon, the cutting garden hellebores will start to show themselves providing stunning flowers to float in bowls of water alongside small vases of snowdrops. Erin: One of the things I love about my job is being able to communicate with flower lovers from the U.K. and so many other parts of the world. For those just getting started, which flowers would you suggest they begin with? 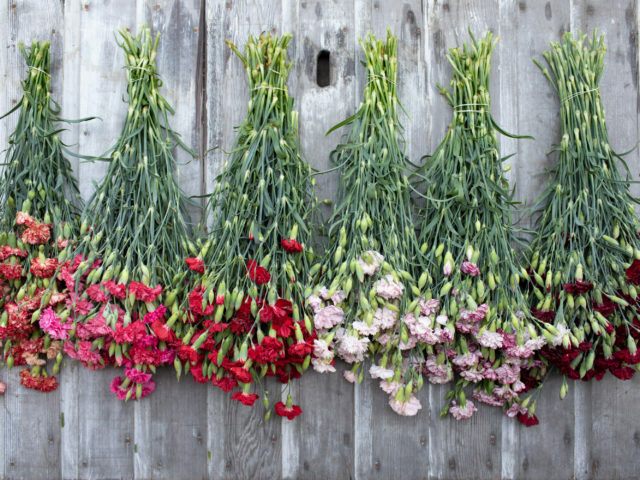 Do you have any tips for people who are new to growing a cut flower garden? 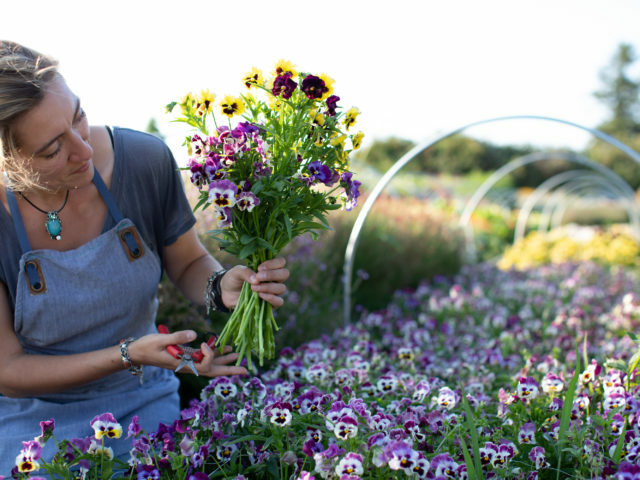 Becky: I couldn’t agree more, I feel profoundly grateful for the connections I’ve made with other flower growers in Britain & all over the world. I’ve benefited so much from their knowledge & it’s a privilege to pass everything I’ve learnt on to others. My first tip for new starters has to be to put time into setting up the basics; consider mulching beds, laying paths, staking & try to understand what kinds of pests you’ll need to prevent. In my first year I’d seen all the astonishing varieties that you and other amazing flower growers had. I read everything about these plants & set about growing pretty much all of them. Those that flowered were stunning and had me hooked, but the rabbits, pheasants, weeds, and endless other unpredicted occurrences made for a year of overwhelm, and there were more unplanted seedlings than I care to remember! So my advice is always to get the basics set up and grow modest quantities of a selection of varieties that really blow your mind; flowers that you love so much you’ll be hooked enough to try again the next year. For those who are new to gardening altogether I’d recommend sowing some annuals, perhaps something like sweet peas, cosmos and malope just to see how much flower power a few packets of seeds and a few months of warm weather can give you. Erin: Great advice! Your new botanical print cards are absolutely stunning. Can you share more about the process of creating these works of art? And I’d also love to learn more about the charitable cause that you support through the sales of the cards. Becky: Thank you so much, I’ve loved making the cards and prints and I really have been blown away by how well they’ve been received. 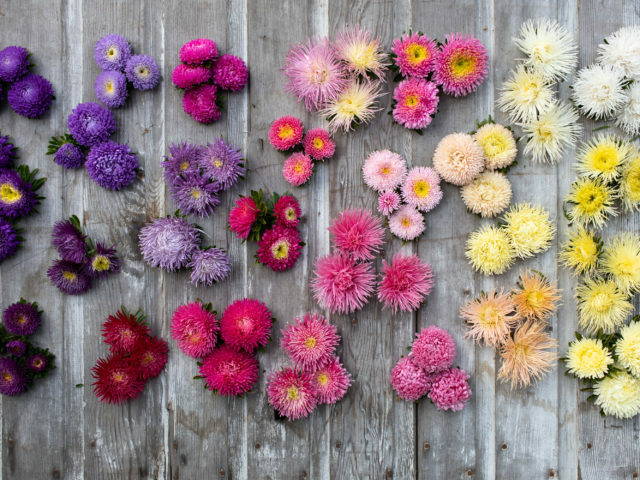 Photographing flowers from the garden started as a way of documenting the seasons and soon became a creative outlet for me too – aptly described by Sarah Statham of Simply by Arrangement as a kind of ‘visual yoga’. The technical side of setting up the cards and prints is a less creative process but the effort has been hugely rewarding. I can’t tell how exciting it has been to send my work off to places such as New Zealand, Lithuania, America, Norway…or even just down the road for that matter! It’s also provided a perfect opportunity to raise money for ASSIST, a charity I’ve been volunteering with for a couple of years. ASSIST support destitute asylum seekers in Sheffield, where I live. The term ‘destitute’ very specifically refers to asylum seekers who have absolutely no government support and for whom it is actually illegal to work. These people are extremely vulnerable as they’ve got no legal way of supporting themselves. They’re not allowed to stay yet there’s nowhere safe to go and often they’re entirely alone. The night shelter where I volunteer opens at 9:45 pm and closes at 8 am the next morning. It provides the basic service of a roof to sleep under, a mattress with bedding and a kitchen where guests can have something to eat and drink. So, at the very least 10% of any profits made from my sales will go towards the much needed upkeep of the night shelter. Erin: I’m really inspired by this, Becky. Thank you for your volunteer service and for sharing your fascinating story with me. I’ve enjoyed this conversation tremendously. I would love to come visit you and tour the Chatsworth gardens some day soon. I’m delighted to give away a print and two sets of Becky’s gorgeous cards to three lucky Floret readers. For a chance to win, simply post a comment below by March 10th. In it, please share your favorite botanical garden, or the flower you’re most excited to see this spring! UPDATE: The giveaway is now closed. Congratulations to our winners: Kirsten Young, Susan Fahy and Amy Reinhart. Please note: If your comment doesn’t show up right away, please sit tight; we have a spam filter that requires we approve comments before they are published. What a fantastic cause – I’m most excited for poppies! Oh I have always loved English Gardens of any sort! So beautiful!! I would love to visit the Chatsworth Gardens one day. I grew up on a dairy farm and my excitement was always walking down the road to my Grandpa and Grabdma’s and there my Grandma would be in her flower garden planted by the driveway as you entered the farm. Her flowers were amazing!! I love color and have planted bright red geraniums between the roses and zinnias everywhere. I love all flowers but the daffodil and tulips and crocuses after a lonnnnggg winter here in Michigan give me a joy untold!! Loved this conversation you both had with each other and the insight!! What a Dream and a life of untold blessings!! Farò tesoro di tutti i vostri suggerimenti per la mia piccola flower farm! Le piccole piante stanno crescendo, diventeranno presto grandi e mi divertirò a comporre bouquet ! E non vedo l’ora che arrivi maggio per godere di tutte le meravigliose forme delle peonie e delle rose. I cannot wait to see my poppies. After multiple attempts to grow these beauties I finally succeeded. Only a true flower lover understands how excited I was when they bloomed. This year I’m trying [again] to succeed with Iceland Poppies and feel hope after reading your blog. Thanks for sharing all these hints. I am really hoping the daffodil bulbs I planted rather late last fall come up. Any sign of spring would be amazing though, as we are still under a foot and a half of snow-so for now I am enjoying my geranium that is in full bloom on my windowsill. The daffodils and hyacinths have started blooming here, and will soon be followed by the tulips, and our redbuds will be blooming throughout the woods before long. I look forward to this brilliant contrast of color against the dull foliage before the trees start leading. I have an obsession with zinnias and have grown quite a few from Floret. I look forward to one day visiting Chatsworth House! Loved your interview and the insight into her yearly growing schedule! I can’t wait for Chinese Forget Me Nots! I have never grown them before and am a sucker for blue flowers! Can’t wait to see the spring bulbs bloom! I can’t wait for my swey peas!!! 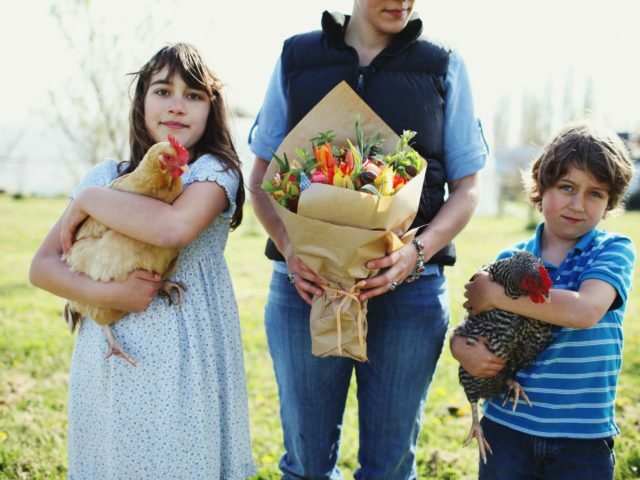 The choices at your farm are amazing!! I love cottage gardens and try to design my gardens in the same way. Can’t wait to see the tulips bloom! I am happy to hear about Malope. I’ve never seen it before and am going to order a packet right now! I love the gardens at Fort Steele (BC) and Heritage Park (Calgary, AB) they are re creations of what the yard gardens would have looked like at the turn of the century and a bit wild and orderly all at once which is what i wish/hope my yard will look like someday. I really enjoy the Sawtooth Botanical Garden. It’s beautiful, interactive, and educational. I’m excited to see everything this spring and summer, especially sweet peas and sunflowers. The plant I am most looking forward to seeing this spring is forsythia. My favorite garden is the succulent collection at Huntington Gardens near LA. That was a wonderful interview and brought back many memories of the year that I lived in Cambridge, England. I experienced so many of the historic gardens, as well as the beautiful home gardens everywhere I went. It didn’t matter how small a home was, there was always room to tuck a few beautiful trailing roses or wisteria or bulbs alongside the home. My favorite botanical garden in my home state is southern California’s The Huntington Libray, Art Collections and Botanic Gardens. It boasts 120 acres of themed gardens, from the famous rose garden to a camellia garden, which is spectacular this time of year, and a tranquil Japanese garden, to name just a few. They have two tea houses and many lovely art collections housed in a variety of buildings on the property. It’s a must-see if you’re ever near San Marino, California! I’ve only been to the Missouri Botanical Garden in St. Louis but it was amazing! My new favorite garden is the demonstration garden at Von Trapp Greenhouse in Waitfield, Vermont. It’s filled with color, texture and intrigue set in a backdrop of the majestic Green Mountains. It rivals any arboretum without a fee to enter and enjoy. Excited to see pretty much any flowers this spring, tulips, daffodils and helleborus to start with. One of my favorite botanical gardens, is RHS Wisley Gardens, Surrey. I worked there for a month as a volunteer and it is a gem of a place to visit. My favourite botanical garden is the one right on my doorstop – the Royal Hobart Botanical Gardens. While it provides a constant array of changing plantings with the seasons, it’s the sheer magnitude of the trees that always draw me in. Many were bought out on the first few convict arrivals, and still stand to this day. Although spring is some way off for us – I’m looking forward to planting some new ranunculus varieties freshly arrived in the Australian market! It would be sweet peas. I have never had too much luck with them. Some years, they would grow, other years they didn’t. I am following advice that I found on Floret and growing the Spencer variety that I bought in the Floret Shop. Hopefully, this will be the year!! This is inspiring to learn about the path that led you to your current job, Becky! Thank you for sharing this interview, Erin! I have never been to a botanical garden but would love to see one before long! Probably up in Vancouver or Victoria BC would be my desired place to start. I am most excited for my new dahlia varieties to bloom this summer! I treated myself to some new-to-me colors and can’t wait to see them! Blossoming branches and magnolia are my favourites in early Spring, but garden ranunculus come very close! I loved the Brooklyn botanical gardens but I am very excited to see the botanic gardens on Kauai this summer. Gardening is such a lovely thing. I’m excited and nervous to try growing carnations from Floret this year. I’m new to all this and would love to read a whole article on weed control. Like she said, it’s overwhelming at times! Really excited to see Ranunculus – as I’m growing them for the first time this season. My favorite garden flowers are in the Spring. I have many perenials due to our short sesson in my region. So I truly am enjoying all the possibilities you show on you site. Thank you. My all time favourite is the tulip, especially when she lets it all hang down…. I so enjoyed this interview with Becky Crowley…. especially looking out on a snowy day here on PEI :) I can’t wait to dig into the soil and begin the outdoor gardening season! My favorite garden to visit is Lewis Ginter Botanical Garden. I am a member and enjoy it throughout the year. My favorite flower ro see this spring will be The sweet peas that I am new at growing. Thank you for sharing this inspiring interview. 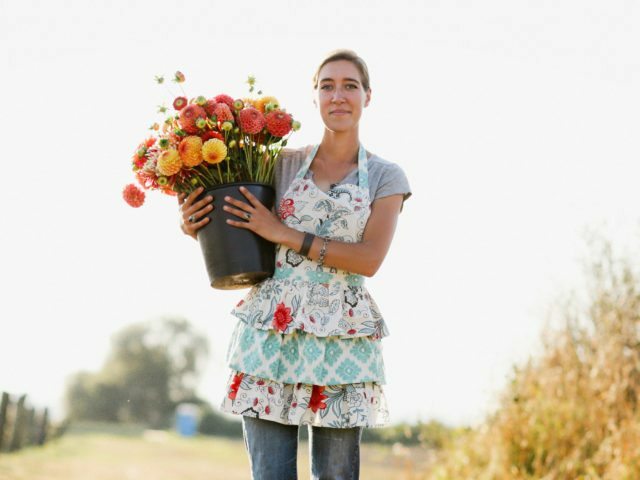 It’s interesting to see how people get their start in the flower industry. I am an ameteur but am in awe of the large scale flower growing industries and the knowledge that goes with successful cutting gardening. So beautiful!! Hellebores and primroses are some of my first blooms to spy in my garden. I’m so eager to see these with all the snow we have on the ground. What an awsome job! This Spring I most look forward to the first blooms from my sweet peas. As a near neighbor to Floret (Stanwood local), I enjoy the Skagit Valley Tulip Festival each year. And I love visiting lavender farms such as Pelindaba on San Juan Island. I would so love to have a tour of Floret someday. What an amazing connection and interview with a ‘castle’ gardener! Favorite garden to visit – Cantigny Park in Wheaton IL….and flower DAHLIA! the wait all season is worth it to see them flourish in Sept and Oct! thanks for the interview and inspiration! I am a follower of Becky on instagram and love her posts and these new cards are so beautiful. Finally ive managed to get an order in for salmon toned ranunculus and look forward to seeing their beauty in real life next spring. Wow! thanks for sharing this interview! The blooming flower is the one I like the most. Sort of like asking what is your favorite fruit? The one I can enjoy right now! Delicious for the taste and soul. Although I am beginning to dream in sweet peas! Drifts of color and scents that call the heart! Maybe its calling me to get more seeds?! Kew Gardens is my favorite botanical gardens – Erin – maybe we should take a trip over to England together and I will give you a tour of my favorite places! I’m looking forward to the Narcissus that I have planted coming into bloom this spring…….I love their scent but also I know when I see them that the worst of the weather is hopefully behind us. I am so excited to grow Nicotiana this year! The Jardin de Metis, Redford Garden in Québec, Canada! I think my favourite botanical garden is The Horticulture Centre of the Pacific in Victoria BC. I guess cause it’s home, cause my grandparents were early volunteers there, and parts of them still show their beauty in the Spring. Looking forward to the first daffodils outside my kitchen window. I can’t wait for my snapdragons to be in bloom. But first I’ll need to start the seeds! You gals are so inspiring – thanks for all you do! Butchart in Victoria B.C. was one of my early inspirations. Looking forward to daffodils blooming over the next couple weeks. I love everything that you do.. You surely have the magic touch with flowers. So much enjoyed reading this interview. Would love to visit Chatsworth Gardens where Becky works. What a dream job! Recently (October – early December) my wife and I did a wonderful travel adventure to Australia and New Zealand. While in New Zealand we spent many hours in the beautiful Hamilton Gardens, and were thrilled to find their early dahlias just coming into bloom. Back home, we had just finished the big process of getting ours all dug and stored away for the winter! A completely different kind of garden was the one we experienced at Hobbiton, also in New Zealand. It too, was magical and beautiful. Right at the moment, the flowers I am most excited to see in our own garden are our crocus! They just started blooming the other day, and despite the pesky piles of snow still laying about, the crocus are a sure sign that Spring is at hand, and soon we’ll be able to get out into our garden again! I look forward to the Sweet Peas which were always in my Grandma’s garden. Cosmos flowers 4me so 4medable ! What a great interview! Becky is a stunning artist and my goodness what a dream come true her position is! I am so happy for her and the career she has made for herself. Keep it up! Chatsworth gardens will be officially on my bucket list after reading this! Here in Spokane we have Manito Park and greenhouse and is the only garden/grounds/conservatory I remember visiting. There are many different sections, including my favorites The Rose Gardens, the Japanese Gardens, and the Gaiser Conservatory! My boyfriend and fellow grower had the opportunity to work in the Greenhouses for a year where they had beautiful specimen plants and a collection of orchids. I would love to visit more places and in each find a conservatory or historical garden to visit! Longwood Gardens is only a half hour away. It is magical every season of the year. Loved your interview and getting to know Becky. So excited for spring and flowers!!! Dahlias! I always enjoy them. Wow, beautiful work. I envy the blooms you can get in England with a moister, cooler climate. For now, I am looking forward to growing so long-stemmed snaps in my garden. I’m most excited to see my specialty tulips bloom! I love just staring at them peeking out of the ground now! We are lucky in North Carolina to have Biltmore gardens and the university sponsored arboretums around the state. Close to both my small hobby farm and also my home is Daniel Stowe Botanical garden. It is perfect for an afternoon visit. Very inspiring. Wow, Becky’s work is beautiful! As for gardens, Kingwood in Mansfield, Ohio is really amazing. Longwood, near Philadelphia, is on my “someday” list. I love flowers and cards. So having a card with flowers on it is a win win! I am so excited I have found this blog and look forward to seeing the rananculus this spring. Thank you so much for giving us all a different perspective. You have such a talent for bringing all of us gardeners together. Becky’s prints are beautiful. I love to photograph my flowers too. It is inspiring that she does charity work on top of her busy job, I try to make a small difference as well by growing cut flowers and bringing arrangements to the residents of local nursing homes. My favorite garden is Thuya Garden, a tiny hidden gem in Northeast Harbor, Maine. I drive 4 hours to visit it every year. They grow a glorious combination of annuals and perennials in a peaceful and serene setting. This garden has been a great inspiration for me, I now grow many of the same varieties in my garden knowing that if they can survive in northern Maine they will be able to survive in my yard in New Hampshire. The Biltmore House and Gardens in Asheville, NC is a magical place for me. What a fascinating story and so inspirational. Thank you for sharing. Erin, your work is gorgeous! I’m always inspired when I see your pictures. I also have your book! Thank you for continuing to share your knowledge. Becky’s work is amazing. I love how she has come full circle, bringing her art background into the garden! In my opinion, nature is the most magnificent artist. I’m an avid gardner but don’t have as much time as I’d like to be out in it. My favorite flower would have to be peonies. The blooms are stunning every year! Becky’s work is so beautiful, thanks for this post! One more place to visit in England ! Becky’s creativity is very apparent in her layouts of picked flowers. Now I know why! I envy her energy. She has a very privileged position, but the responsibility must be enormous. One of my favourite gardens near to where I live is RHS Wisley. I love the trial beds and the rock garden, but mostly the shrubs, perennials, trees and bulbs because they ALL have a label and I love learning about plants. My favourite flower at this time of year is probably bluebells. I am excitedly waiting for my newly planted Black Peony Poppies (Papaver hybridum) to bloom this Spring! Can’t wait for my Dahlias! I live in the rose capital of the world, Tyler, TX. The Tyler Rose Garden is spectacular! This year, I’m especially excited to grow Lavatera trimestris and Heliotrope. I can’t wait for all my English garden roses to start blooming late spring! Sweet Peas are my absolute favorite! Absolutely stunning! Dahlias are my favorite! Vandusen Botanical Garden in Vancouver Canada is a treat. Your interview was interesting. I love the botanical garden in Oakland California! I can’t wait for my sweet peas to bloom. Can’t wait for the Hellebores!! A very inspiring interview – informative too, many thanks! I am excited for daffodils, and a favorite Botanical gardens are the Denver Botanical gardens. I am excited for my last year favorites, ‘Rosetta’ Cosmos and Blue Monday sage, Salvia horminum. Both are incredibly easy to grow and ever-changing throughout the season. We’re planning a trip to the UK this October. Chatsworth House is on my list of places to visit. I really enjoyed this interview, and I’m even more excited about potentially seeing Becky’s work! I always look forward to Camellias, one of my all time favorites. I love my deep blue larkspurs in spring. I love sweet peas. They bring back happy childhood memories and I always look forward to their smell come Springtime. My favorite botanical garden is the US Botanical Garden in Washington, D.C. I love sweet peas. They bring back happy childhood memories and I look forward to their smell every Spring. I can’t wait for sweet peas! I look forward to the arrival of peonies each year! I have never grown Stock before. I am so excited to see how Malmaison Pink does in my garden this year! My favorite botanical gardens are in San Francisco, California💚💛💜❤🧡 Such BEAUTY and BREATHTAKING COLORS!!! I look forward to the blooms of my snowball bush every year. They are just beautiful in a vase with very little fuss. I’m looking forward to seeing how the D.A. English Roses that i Just put in last spring, perform after a hard Michigan winter. The blooms on the yong plants were precious to me last season. I’m anxious to see more. My favorite botanical garden can be found in Monticello, Illinois, USA. The Robert Allerton estate has been “in my family” for nearly a century (four generations), as it was a favorite place to visit on spring/summer days for my mother, me, my daughter and now four year old granddaughter. The peony garden may always be the one that most lovingly fills my soul. Very inspiring. I can’t wait to plait ranunculus in my garden this year! Of course I bought the smalltubers from Floret! I am most excited to see ranunculas this spring! This prints are truly incredible. Thank you for amazing interview. I would have to say one of my favorites botanical gardens would have to be Butchart Gardens in Victoria, Canada. My husband took me there few years ago for my birthday. 2 years ago I visited Kew Gardens in London, even though it was the middle of winter it was still over the top inspiring and full of so much history and information, not to mention amazing exotic plants in the massive glass houses. I long for warm nights and the intoxicating scent of sweet peas wafting through the air. I love Longwood Gardens in Pennsylvania. So beautiful to visit there each season. My favorite flower is the peony. I am looking forward to Ranunculus. They are one of mu favorite spring flowers. Snow drops are another favorite, but they are already up. I love Piet Oudolf’s meadow style design at the High Line elevated park in NYC, and the public gardens at Wave Hill estate in the Bronx. Now that I’m hooked on gardening, I hope to travel around the UK visiting gardens there! I love the gardens at Montpelier in Virginia. My husband took me there last summer for our anniversary and it is beautiful! I love visiting the botanical gardens of the cities I visit. My favorite, however, will remain my first: the small but mighty Durfee Conservatory on the campus of the University of Massachusetts Amherst. I am most excited for ranunculus! I love the Missouri Botanical Gardens in St Louis. It feels like I’m entering a wonderland every time I visit. I absolutely loved the National Arboretum in Washington DC! So thankful that flowers truly do connect us all. So beautiful! My favorite botanical garden was at Cornell in Ithaca, NY. I went to visit their corpse plant ‘Wee Stinky’ when it was in bloom. It was an amazing experience! The A line in NYC is one of my favorites. My favorite public garden I have visited recently was the Antique Rose Farm in Snohomish, WA . It smells absolutely heavenly in the middle of summer and feels like you are in a dream! I am starting my first cut garden this year. In the passed years I have had vegetable gardens but quickly my obsession is shifting to flowers. I can’t wait to experience more gardens soon for inspiration! My husband and I were lucky enough to go to Maui for our honeymoon a few years ago and we visited the Garden of Eden Arboretum. It was simply amazing and definitely a highlight of the trip! Thank you for yet another amazing interview!! As other commenters have mentioned, the journey of her life toward her current career mirrors my life too. I love the phrase regarding flower photography as “visual yoga”; it made me think of how I feel gardening: mindful, physical, and connected a bigger life experience – yoga!! What an epiphany! I have been visiting formal public gardens in North America and Europe as long as I can remember. I have many favorites, but a favorite, “humble”, garden memory of mine is of the exuberant summer window boxes of the Alpine regions of Europe. I love the explosion of color, the fluttering movement of the “trailers”, the contrast between the soft texture of the flowers against the stucco and beams of the buildings, and the amazing quantity of plants in each box way above the street. All carefully tended from inside the house!! They are a visual treat and testament to what extent people will go because of how important flowers to our lives! Visiting more formal gardens I learned I love the symmetry and garden structure created by hedging. Attempting to recreate these features in my own gardens over the years has lead to another important discovery: I hate trimming hedges! So, I have adapted and learned to appreciate and work with the more natural growth of plants to create enclosure, invitation, texture, seasonal interest, and floral material for my home arrangements, and, I am much happier for it. Peace through growth, rather yoga like, I think. Thank you again for sharing these wonderful flower people with us! Just visited the Botanical garden in Wellington, New Zealand. It is beautifully laid out with plants well labeled which helped in identifying species different than here in the Midwest. Hello Erin I thoroughly enjoyed this article. I have been to London and other countries but it was when I was 18 years old and am now 36. What an inspiring person this Becky Crowley is! As we read your articles and dream about our garden of what could be… thank you so much for the outlet you provide to dream about and be inspired by such beautiful people and their work. backyard grower of flowers and vegetables. One of my favourite gardens, a country garden open to the public is Ayrlies Garden in New Zealand. The Sofiero Palace Garden near the city of Helsingborg, in the south of Sweden. Their selection of dahlias is mind blowing. And the apple trees, oh… It’s a perfect place right by the sea, and open to the public all year long. Thanks for interview Erin and Becky! Love it, very interesting and inspiring story. So far, Versaille gardens and Schonbrunn garden in Vienna was grandest that I’ve visited.Waiting for my trip to UK and all these beautiful gardens💕. Best wishes to you two! This is a great interview! So inspiring to me; someone who is currently navigating the shift into a more garden focused world. I, too, can see little signs of life experiences that have led me here which is pretty cool :) There is a garden here in my hometown called Milner Gardens which is certainly something I love being able to visit whenever I want. Also here on the island I live is the world famous Butchart Gardens which is breathtaking anytime of year. Love love love!! What a wonderful interview!!! I provide linguistic services at the U.S. Immigration Court, so this topic is very close to my heart. My absolute personal favorite botanical garden is Missouri Botanical Garden. Coming in on second place is the Parque del Retiro in Madrid. I love Butchart Gardens in Victoria. Lucky for me it is only a 1.5 hour drive to visit. I’ve been there in all four seasons and it never gets tiresome. It’s always a destination when family visits. Some may say it’s expensive but each time I go I feel such value for the money I’ve spent. It truely is a magical place. Wonderful interview! I lived in London for a year and said often “No one gardens like the Brits!”… then I discovered Erin at Floret and that changed everything! I am lucky enough to live near to Chatsworth House and see the fabulous work done in the gardens. To say it is such a huge estate, the gardens are intimate spaces full of wonder and inspiration. I only recently discovered the cutting gardens as they are tucked away but they are an absolute delight and full of ideas to bring back home. I’m so happy Becky has come out of the potting shed to show more of her work and artistic side – she will never get any work done now as we will all be looking for her to have a chat on our next visit!! Thank you Erin and Becky!! Wow!! What an incredible story and opportunity. It’s like a fairytale! Very magical and such beautifully planned out gardens. Thank you for sharing this with us. Hard to pick just one of my favorite gardens so I would have to say the Berkeley Botanical Garden and UCSC Arboretum. Very cool to hear the perspectives of a gardener from “across the pond.” I dream of habitants English garden, without breaking the bank in water with my colorado climate. My favorite botanic garden is the Denver Botanic Garden. There is also a really nice mountain botanical garden in vail set up by Betty Ford. Oh to have a glass house! Here in Minnesota it is snowing again. We have about three feet in the ground. My favorite garden is the Minnesota Landscape Arboretum which I am lately viewing via xc ski trails. I won’t be starting any seeds until May but I love to hear about the adventures if others! Longwood gardens in eastern Pennsylvania. Just magical in every season :) thanks for sharing becky. Such an enthralling interview. I’m new to flower farming; this is my inaugural year and Becky’s story and history is so tangible, that I think I might just be able to pull it off. The idea of maintaining balance between field, glasshouse and office has such resonance. Living in the UK i’ve been to Chatsworth House several times, it has an atmosphere to it that absorbs you and you enter a place that time preserved. The art work is an inspiration! This week I have precooled bulbs that bloomed early in the unseasonably warm weather and no where to sell them. Becky has given me a seed of an idea to capture this beauty before I pass donate them to my local primary school, and will cushion the sadness of loosing a saleable crop. I’ll be looking into a print or two for my workspace, to keep me motivated when this whole venture gets a bit tough. Thank you for interviewing Becky! I thoroughly enjoyed your post. I love Longeood Gardens and the gardens at Winterthur in Montchanin, Delaware. I’m enthralled with all this beauty you ladies help bring into the world! Gardeners are truly the most generous people, whether sharing plants or knowledge or funds. Chanticleer Garden in Wayne, Pennsylvania is one of my top three favorite gardens. Beautiful and creative, it’s very clear that the lucky gardeners who work there are having a really good time! I love the Butchart Gardens in Victoria, Canada. I was amazed to see blooms I am familiar with – but three times the size I am used to see them growing in Colorado. I love that they took an exhausted limestone quarry and made a sunken garden. Then the gardens kept expanding, over tennis courts, etc. I would love to go back again some day. Last year my husband I visited Sherman Gardens for the first time- a lovely garden in Southern California. Oh to have a glass house! Here in Minnesota it is snowing again, about three feet on the ground. I love the Minnesota Landscape Arboretum which I am enjoying lately via xc ski trails. I won’t be starting seeds until May so it is fun to hear about the adventures of others! What a great interview! I’ve been following Becky Crowley in IG but didn’t know her history. My favorite gardens are found at Schonbrunn Palace in Vienna, Austria. I had the chance to wander the grounds for hours while visiting last year. Longwood Gardens is my favorite by far here on the East Coast. Gorgeous any time of the year – the orchid room is stunning! I love your work Becky! Thanks for sharing Erin! What a wonderful interview! I actually had the opportunity to tour Chatsworth House when I visited England, about 10 years ago, on a Pride and Prejudice tour. The House’s grounds are truly magical! It was so interesting in the interview to read about the daily life of their gardener. One of my favorite gardens to visit is Longwood Gardens in PA – they do a really lovely Christmas display. Enjoyed your interview with Becky, great advice and lots of inspiring ideas. My favorite public garden would be the gardens in Hagley Park in Christchurch New Zealand. Years ago on a first biking trip to Europe we stumbled upon the last day of the keukenhoff in Holland! It was mind blowing , the swaths of colour , the varieties, the glass houses with exotics ! Parham house and the cuttinggarden from Sarah Raven. My favorite is the Frelinghuysen Arboretum, Morristown, NJ. They have nice pathways for a stroll in the garden and very interesting collection of flowering shrubs. The Portland Japanese Garden in Oregon, and the Denver Botanic Gardens in Colorado. Both are beautifully unique in their own way! My favorite garden is Gravetye Manor. We visited last September and the trees on the estate are worth a visit. What a wonderful interview. Thank you so much for all you do. Favorite garden is one that no longer exists… Stirling Forest Gardens in Tuxedo, NY! My love of everything garden started there. Waves of planted flowers, beautiful paths, ponds. Can still picture it!